August Birthstone - The Peridot! August's Birthstone - The Peridot! The lime green of Peridot birthstones become a mellow glow, under a moonlit sky or a lantern light, which has earned it the name, Evening Emerald. The stone of love, warmth and openness, Peridot has been revered by both priests and pirates alike for its property to ward off evil. This gem has more in store for every wearer than just those born in August. A piece of jewelry gets a little more meaningful if it can bring a new meaning to the wearer’s life. Birthstones, associated with each month, come with certain qualities which positively affect people born in the respective month. Peridot, the August birthstone, is known for its healing powers and its ability to bring good luck. Peridots oscillate between shades of olive and lime green. This translucent gem derives its name from Greek word, ‘faridat’ which means gem. This is one of the rare gemstones, which is found only in green color, with the shades changing in accordance with iron content It is also believed to enhance relaxation, comfort, openness of the mind, sleep, invigorates health and inspires healing. 1. Some people believe the word peridot is derived from the French word peritot, which means "unclear". The French were the first to call this yellow-green stone peridot in the 18th century. Before then, peridot was known as topaz. 2. Gem quality peridot comes from the Red Sea, Myanmar (formerly Burma), Australia, Brazil, Germany, Mexico, Pakistan, Arizona and Hawaii. Most of the world's production of the gem comes from Arizona where there is an abundance of lower quality peridot. Varieties of peridot that originate from Myanmar, Pakistan and Egypt are more rare and of better quality. 3. In Hawaii, peridot symbolizes the goddess Pele's tears. Some Hawaiian beaches are packed with tiny grains of peridot that are too small to cut into gems. 4. Ancient Romans called peridot the evening emerald because they noticed that its green color was so vivid in evening lamplight that it resembled the deepest green of emeralds. 5. The Smithsonian Institution in Washington, D.C. is home to the largest cut peridot, a 310-carat gem. 6. Peridot is one of the most difficult gemstones to polish. Vinegar is sometimes used to help in the polishing process. In addition, due to the softness of the stone it cannot be treated with steam or ultraviolet treatments for inclusions. 7. Peridot is (so far) the only gemstone found in meteorites. 8. Early miners looked for peridot at night because they believed that light from the moon made the crystals easier to find. 9. Peridot has been mined as a gemstone for an estimated four thousand years and is mentioned in the Bible under the Hebrew name of Pitdah. 10. The birthstone of August is said to bring the wearer good luck, peace and success, its powers also include health, protection and sleep. The advantages of peridot are to attract love while also soothing nerves and dispelling negative emotions and anxiety. 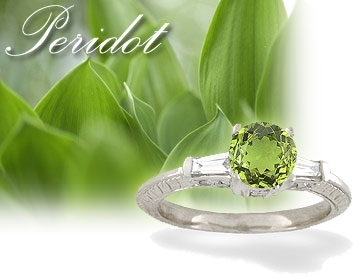 Click the link or image below to browse more of our favorite Peridot pieces!